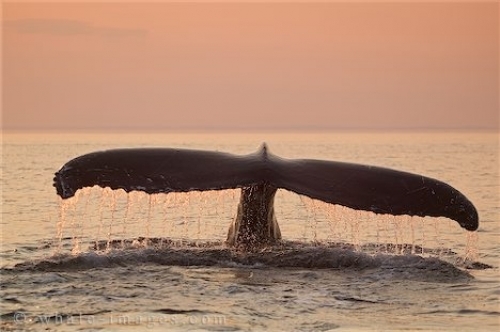 This beautiful picture of a whale tail was taken right after sunset. The diffused light from the sun has turned the water and sky a beautiful peach color. The added effect is the perfectly positioned tail with the water streaming off the back edge as the creature lifts its whale tail and dives away from me. This is one of my favorite pictures of a whale tail. Check out more pictures on the topic Whale Tail. Picture of a Humpback Whale tail and water dripping off, photographed during sunset.